It was back in October 2006 and I was preparing to go to sleep when I finally remembered that I had to remove some clothes from the washer. As I came downstairs to go to the laundry room, I saw that the curtains of the family room were open. 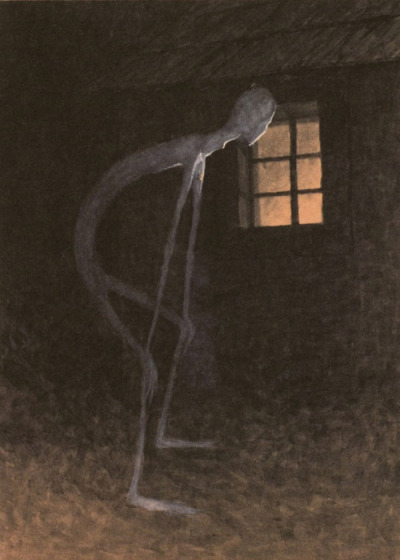 I could see through the light coming from outside a creature standing on the balcony, crouching by the window. The face was very striking. It wasn’t human and it had a kind-of orange colour. It knew I was terrified and I knew I could do nothing but pray for protection from God. I turned, went straight back to my bedroom and I didn’t look back. I was fine—but a few days later I found myself struggling with chest pains. I know the two were related—but what was that thing? watercolour, white paint, paper, 46×35. NG, Prague. Urban, Otto M. In Morbid Colours: Art and the Idea of Decadence in the Bohemian Lands 1880-1914. Arbor Vitae, 2006, p. 370.